Two models designed to meet the needs of riders who want a level bike when they train. The Kinetic Fixed Riser Ring is adjustable to four heights to simulate flat roads on almost any bike. Sits under front tires for a stable ride, no matter how hard or long the workout. The Kinetic Turn Table Ring has the same features but with the addition of allowing the front wheel to steer. Your browser isn't supported for displaying eBay items. 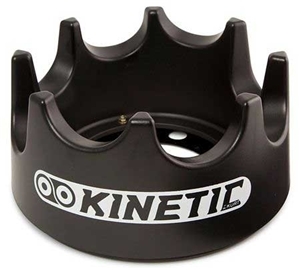 Go to eBay to search for Kinetic by Kurt Bicycle Trainer Fixed Riser Ring T 750C.